Randori Kumi tachi Kumi jo turning around to the rear entering in a straight line pivot from one hanmi to the other. in reverse order receiver — a person who receive a technique. It generally refers to the person who attacks and is thrown. thrower — a throw or the person who does the throw. the distance between uke and nage. It literally means "Harmony of space." unbalancing an opponent's posture breathing, breath power the art of taking falls, literally "receiving body". a sacrifice technique, in which nage falls down to effect a throw. Aikido calisthenics basic blending practice partner ki practice done in seiza, practice for coordinating breath, ki & movement. knee walking nage is kneeling and the uke attacks from a standing position. 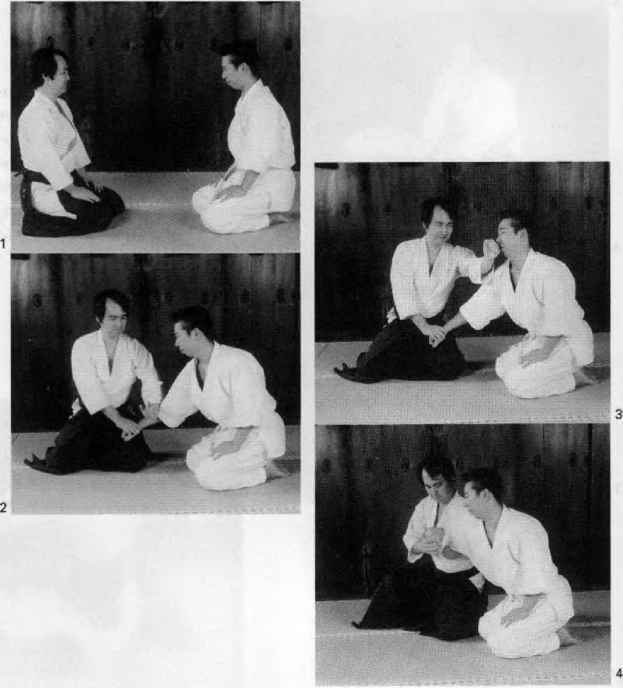 Literally, "half standing, half both nage and uke are kneeling the unarmed Aikido techniques, body arts prearranged attack/defense exercise individual practice of a single movement of the striking techniques switching from one technique to another counter techniques knife taking techniques sword taking techniques staff taking techniques freestyle defense practice, any technique may be used.